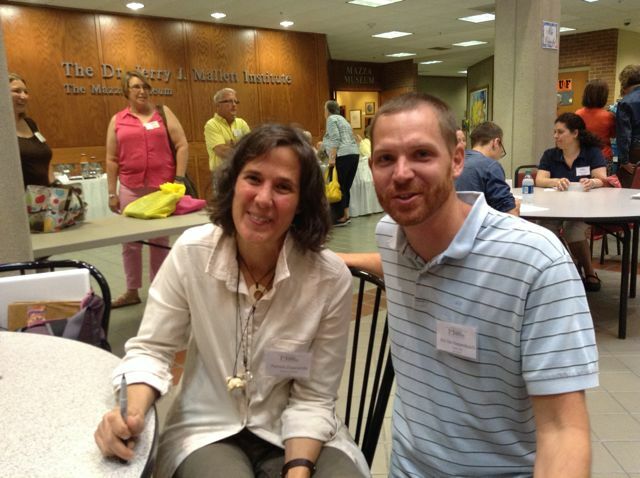 In the summer of 2014, I heard Pamela Zagarenski speak at the Mazza Museum in Findlay, Ohio. During the keynote, as I often do, I wrote down an activity idea to do with my children for a birthday celebration. 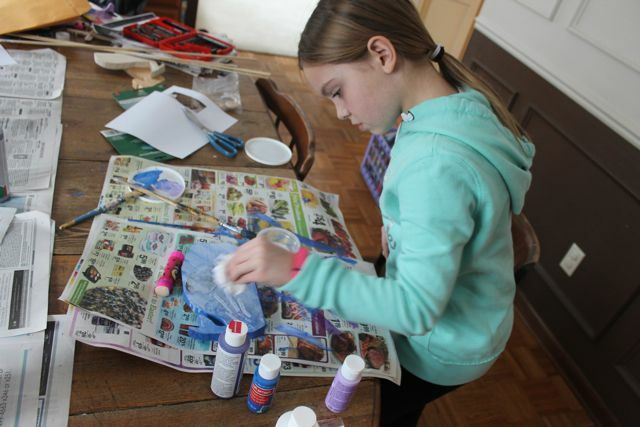 The idea was to create a large painting with mixed media that included family symbols and artifacts much like Pamela's artwork. When February 18, 2015 came around I couldn't quite wrap my head around how I was going to pull it off with my children. We had created large paintings in the past, but this idea seemed bigger. Pamela's birthday passed without a celebration from us. This year, I was still committed to the idea of creating a large painting and started planning my thoughts earlier with hopes of figuring out the project. But, I had nothing. 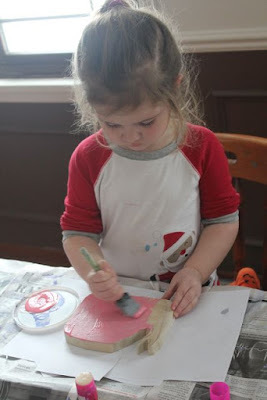 I didn't know how I would help my children start the painting. I felt stuck. I needed something to focus on to make the idea manageable. So, I reread all of Pamela's books. At this point, I even tried to think of a different activity, but my mind kept searching for a way to make the large painting. 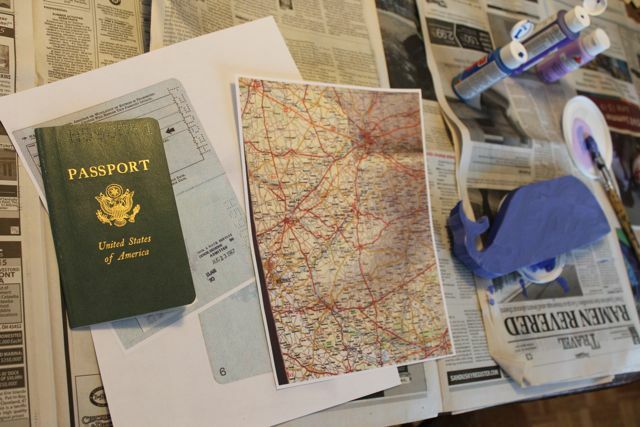 This weekend, my mom gave me old family photos, documents, and my dad's old passport. I thanked her, but told her that I didn't think the project was going to happen. At that moment, I gave up on the idea once again. Another year was going to pass without celebrating the birthday of an illustrator I greatly admire. That night I went to bed and decided to grab Pamela Zagarenski's book Sleep Like a Tiger, the book she signed for my children in 2014. I read the book again. This time without the pressure of that original idea. My mind was completely open. Like magic, I had a new idea. I knew right away how to accomplish the project and with the help of a snow day and some very creative children it turned out better than my original idea ever could have. 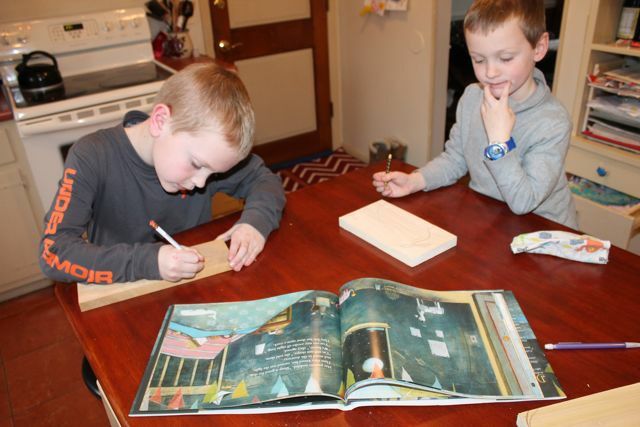 Pamela Zagarenski always wanted to be a children's book illustrator but she majored in mathematics when a high school guidance counselor told her not to waste her time on art. Later, she secretly changed her major to graphic design, and never took an illustration course. (Mazza Museum Keynote). After college, she worked for Weekly Reader making illustrations and published her first book Windmill Hill. (Seven Impossible Things). After her second book, My Big Dictionary, which has sold over 500,000 copies, Pamela stopped illustrating to sort through changes in her personal life. During that time, she began working at a retail shop that featured unique gifts, but she never stopped creating art. In fact, her art took on a BIG change. It got bigger. She painted art as big as 16 feet by 6 feet. She told Seven Impossible Things, "I painted nonstop, every free moment I had, painting huge paintings, no longer tight and small. Freeing myself up. Moving on. Changed my life and my illustrations. 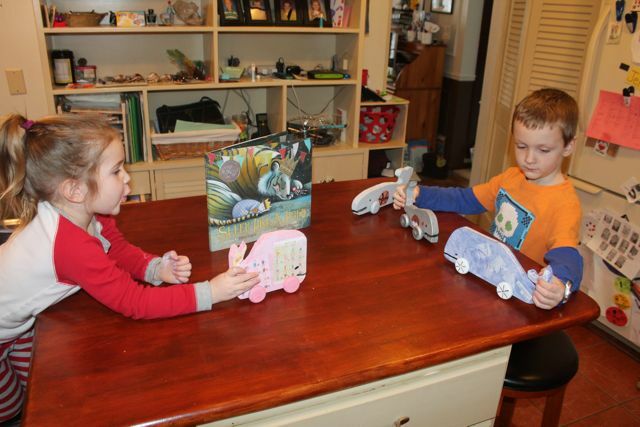 That is why my earlier books to my books now, the illustration styles are very different." 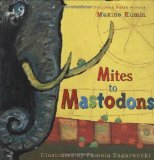 In 2006, the her change in illustration style was evident with Mites to Mastodons: A Book of Animal Poems by Maxine Cumin. In 2007, Pamela published the first of three books with Joyce Sidman, This is Just to Say: Poems of Apology and Forgiveness. 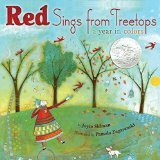 Then, her second book with Joyce Sidman, Red Sings from Treetops: A Year in Colors brought her a Caldecott Honor award in 2010. She told Seven Impossible Things, "It is an illustrator's dream to have such inspiring words to play with!" Her third book with Sidman was What the Heart Knows: Chants, Charms, and Blessings. 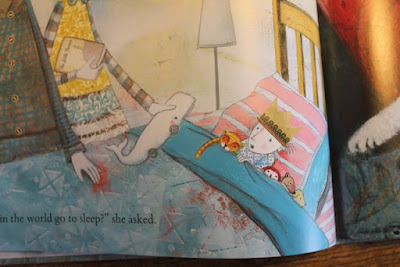 Shortly after this book came, Sleep Like a Tiger by Mary Logue which brought Zagarenski her second Caldecott Honor in 2013. Sleep Like a Tiger is the book that inspired our birthday celebration activity for Pamela Zagarenski. I love this book because Pamela's unique illustrations shine brightly. You will notice tea pots in many of the illustrations because she thinks better with tea and she used to drink tea with her grandmother. You will find sperm whales in many of the illustrations too because of her experience finding one washed up on the beach by her home. You will see foxes because she once encountered one that walked into the retail shop when she was working. If you look closely at her illustrations, you will see how Zagarenski uses elements from her great-grandmother's passport too. You will see wheels under the feet of people, animals, and things because we don't stop moving. And the crowns. There are so many crowns! I get lost in her paintings. Sleep like a Tiger is a story about a child who doesn't want to go to sleep. Her many toys are close by as she puts on her pajamas, brushes her teeth, and gets tucked into bed. She asks her parents, Does everything in the world go to sleep?. Her parents answer this question and many others. As they leave the room they tell her she can stay awake all night long. But, she soon falls asleep and her dreams are full of the thoughts and images from the bedtime conversation with her parents. 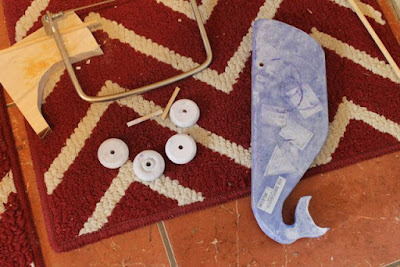 The night I went to bed without the burden of the my original project idea, I was drawn to the girl's whale toy with wheels. When I saw this whale toy I was inspired to make one instead of the large painting. This smaller object gave me the confidence that I needed to create a piece of art with my children. I thought I could make a whale toy with wheels and add elements of family and personal experiences like Zagarenski does in her artwork. We had many pieces of scrap wood. 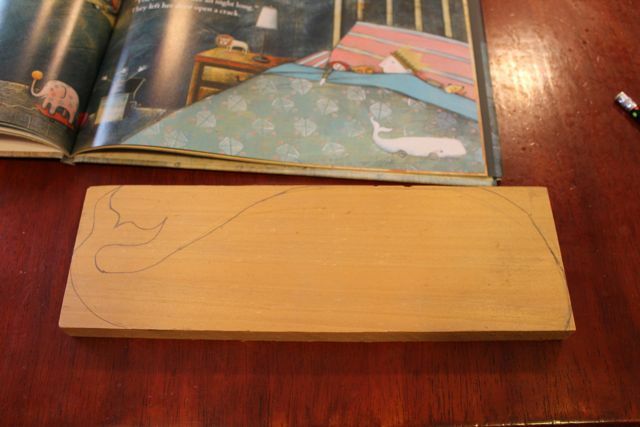 We sketched our whales with a pencil. I told my boys they could make their whale however they wanted. 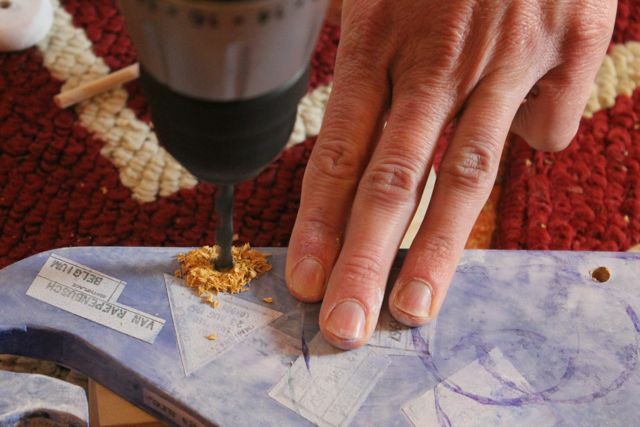 I suggested using the edges as much as possible to make it easier on me when I carved them out. 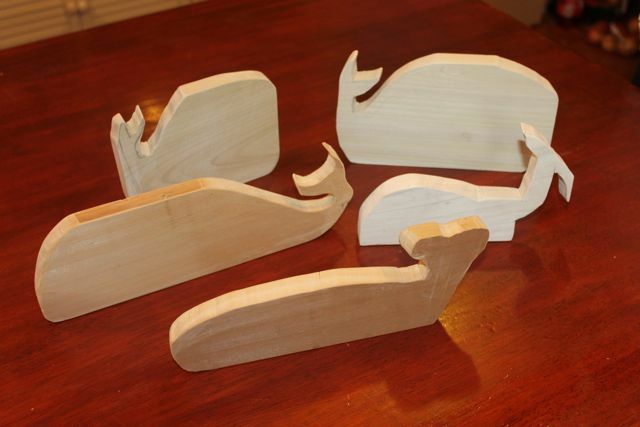 I used a coping saw to carve out the whales. 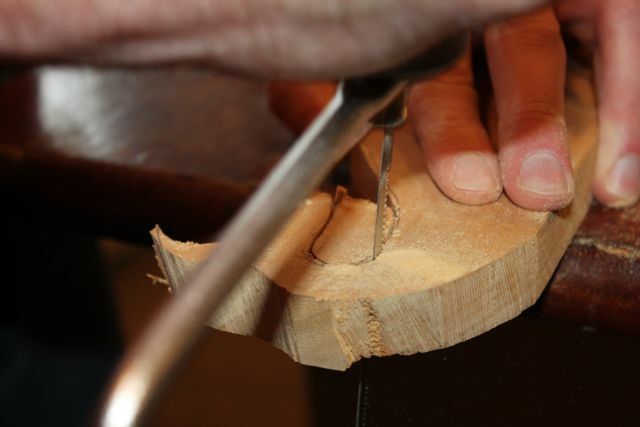 In this photo, I was holding the wood by hand. By the third whale my arm was tired and I used the vice in the garage to hold the wood as I cut. 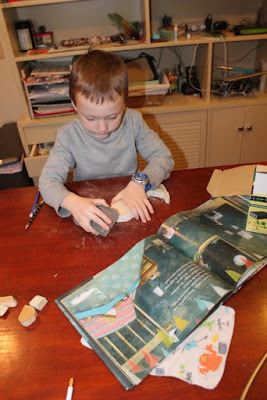 The scraps of wood were fun too. 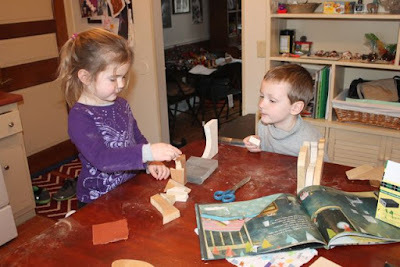 My youngest two children were pretending the curved pieces of wood were a skateboard park. Five unique whales were sanded and ready to be painted. There were reports of a snowstorm coming. 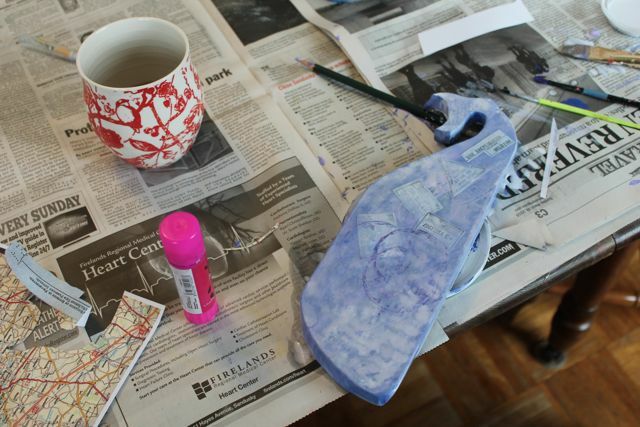 I hoped it would bring a snow day so we could work on our whales together. 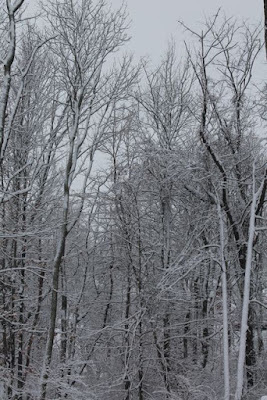 The snowstorm came at the perfect time. It dropped four inches of heavy snow early in the morning. It was enough to cancel school. I made a fire first thing in the morning. 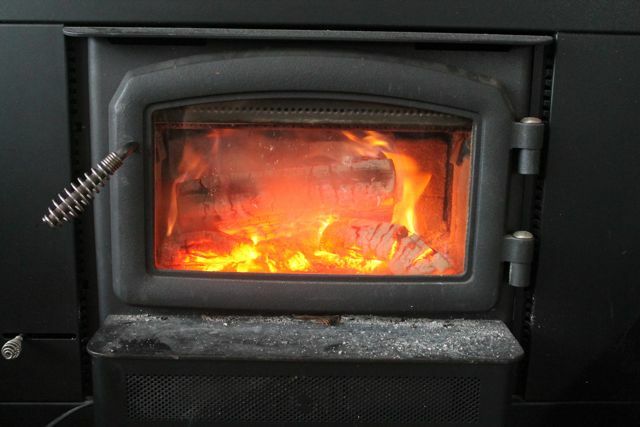 I knew I would need this warmth after shoveling the driveway. After shoveling, the kids built forts outside, but I couldn't wait to come inside the warm house to work on my whale. I copied pages from my father's passport and a map of Belgium to add to my whale. I think best with coffee. 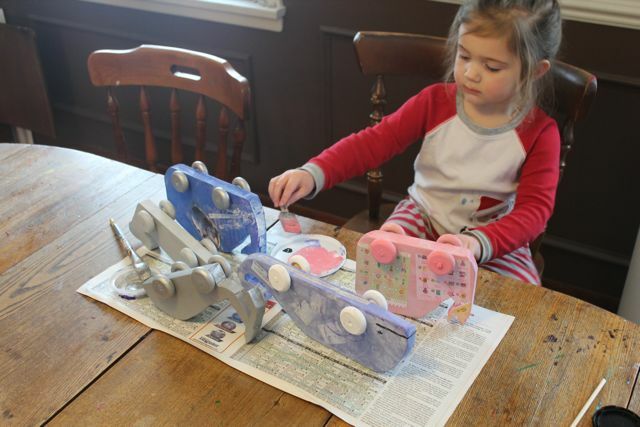 My oldest daughter was the first to come back inside and she set to work on her whale right away. 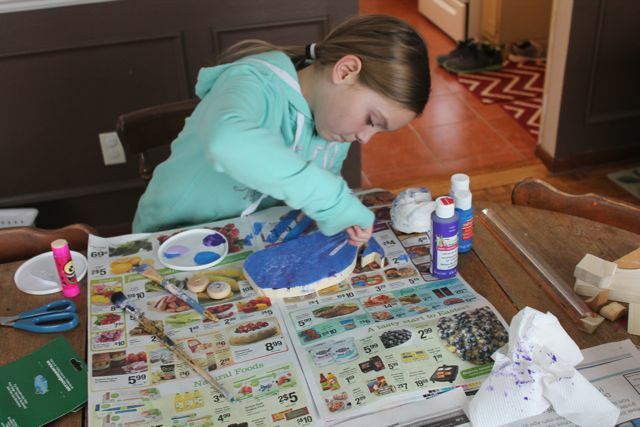 She used a paper towel to blot her whale which gave it some texture. My youngest daughter came in next and she wanted to paint her whale pink. Once my whale was dry I needed to figure out how to attach the wheels. 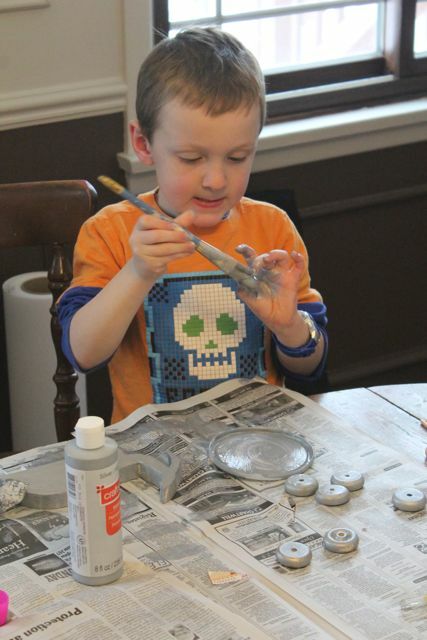 I painted four wooden toy wheels that I bought at Michael's craft store and I cut a dowel rod to size. The dowel rod should fit snugly in the wheel. I drilled two holes in the whale approximately 3/8 of inch from the edge. The holes were slightly bigger than the dowel rod to allow the wheels to spin. It wasn't long before my boys were inside and painting their whales too. 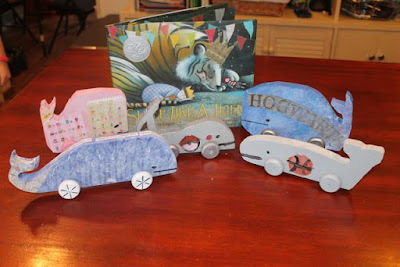 My youngest son painted his whole whale silver including the wheels. After some hard work, all the whales had wheels. My daughter was thrilled with her Shopkins whale. She chose to add papers from her Shopkins toys after I asked her, "What do you really like?" She said, "My Shopkins." 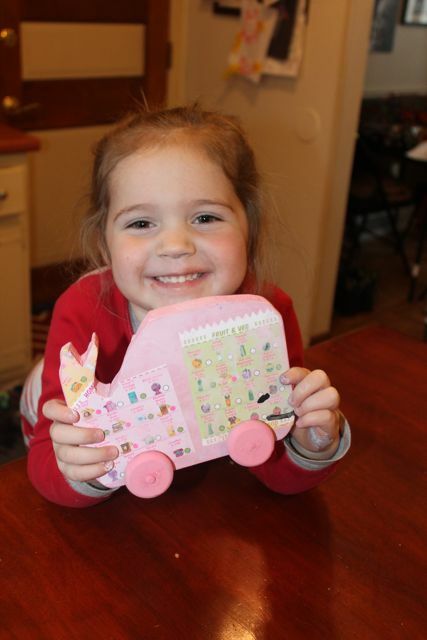 So to make this whale her own we added the Shopkins paper. They played with the toy whales! My oldest daughter made her whale her own by adding things from Harry Potter and a rhino which was the mascot of her Lego Robotics team. My oldest son painted a basketball and baseball on his whale to make it his own. My youngest son added a Poke Ball to his. Five unique whales inspired by Sleep Like a Tiger. Pamela, thank you for sharing your birthday with me at Mazza. We hope you have a wonderful birthday. Your books and artwork are an inspiration. I enjoyed getting lost in your artwork with my children.